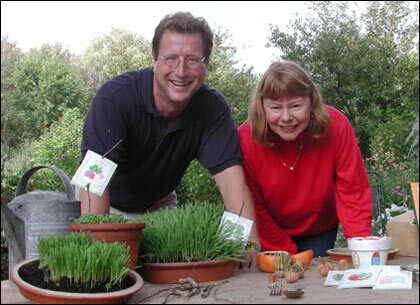 Michael Weishan with gardener and author Sharon Lovejoy. Gardener and author Sharon Lovejoy visited The Victory Garden to discuss some of her ideas about getting children interested and out into the garden  an important role for grown-up gardeners to play. Below she shares her approach to a few familiar basics, specially tailored for gardening with the kiddos, from her book Roots, Shoots, Buckets & Boots. In gardens where grown-ups share adventures and victories with children, there are more things blooming than flowers and trees. Here's what you need to know to make your garden a place where you and the kids grow together. Since children can easily feel overwhelmed by long lists of chores or extended work periods, chop gardening time into short blocks. Choose a different area each day and work together for ten minutes. Celebrate a day of weeding with a ten-minute weeding contest. Organize a task force to "uncrowd the plants" with a ten-minute transplanting. Kids love to do the watering. Sharon also recommends some junior-size tools to appeal to your child's own sense of scale. I always tell my small helpers that I treat my plants the way I want to be treated. I wouldn't want to go through a hot summer day without a drink, and plants shouldn't have to suffer through a dry day either. If plants are thirsty, give them a long, deep drink  enough water to soak the ground around them to a depth of at least 3 inches. Kids love to water. They'll never check to make sure they've satisfied their ten-minute goal with this job. Teach them to do the "poke test" before they water: Push a finger an inch or so into the soil. If it feels dry, water deeply. If it's moist, don't water. When plants sit day after day in soggy ground, their roots may rot. Be sure to direct the stream of liquid at the base of the plants, not the fragile leaves or stems  especially if they are small. Water early in the morning, so the moisture soaks into the earth instead of evaporating in the hot, midday sun, and don't use any more water than necessary. Collect rain and runoff from the roof of your house in buckets and barrels. Red wheatberry is a great choice for growing names or initials in no time. Kids enjoy the rapid results of fast-growing plants. Like people, plants need nutrients to grow. I recommend using organic fertilizers because they break down slowly and provide the plants with a steady supply of nutrients. Examples of organics include compost and aged, bagged manure, which you add when preparing the soil, and liquid kelp and fish emulsion, which you apply during growing season. For convenience and health reasons I recommend buying bagged manure for your gardens. This manure goes through a pasteurization process that destroys bacteria and pesky weed seeds. When fertilizing your plants, always moisten the soil with clear water first. If fertilizer is applied directly onto dry soil, it may burn the plant's roots. Stop! Before you pull a weed, examine it and compare it to the plants nearby to make sure it's not one of them. Look at the shape of the leaves, for example, and how they are arranged on the stem. Pull weeds by hand or use a stirrup hoe, then gather them up and dump them on the compost heap. Children like to deadhead; just saying the word usually elicits a giggle. To help them understand why they're doing this job, explain that plants produce flowers, which bear seeds to ensure future generations. Producing seeds uses energy the plant would otherwise spend on blooming. If you clip off a faded flower, you'll stop its seeds from ripening and encourage the plant to send out more blossoms. Give kids a workbasket and blunt scissors or clippers, and show them how to cut at a node just below the flower. 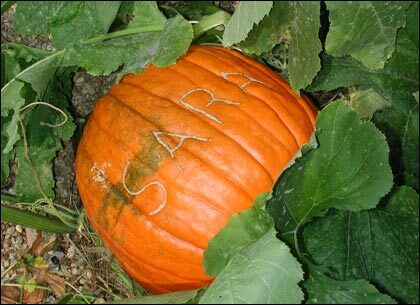 Another fun trick is using a ballpoint pen to engrave a pumpkin with a name or message. As the gourd grows the, kids can watch the engraving become more and more pronounced. At the end of summer, let some flowers go to seed and collect them for next year's garden. Simply hold an envelope under the seed head, clip the flower off its stem and let it fall into the envelope. Mulch is earth's coverlet, a blanket of organic materials we spread over our gardens to conserve moisture, deter weeds, and prevent erosion. Some common choices are hay, straw, corncobs, wood chips, and aged sawdust. Spread a 2-to-3-inch layer of mulch around seedlings and on beds. Because these natural materials decompose into the earth, you may have to repeat this process several times during the growing season. I think of mulching as a ritual of giving back to the earth some of the nutrients I remove in harvesting. It gives me the same sense of satisfaction I used to feel when I'd tuck my young son into bed under a warm quilted comforter. Sharon suggests kids use everyday biodegradable "containers" to garden in. 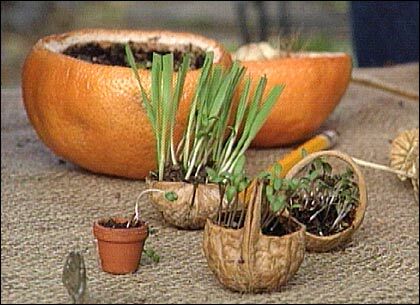 Half a hollowed-out orange or grapefruit makes a great pot that can later be transplanted directly to the ground (and becomes its own compost!). And carved walnut shells are perfect to hold a miniature crop of crinkly cress. Introduce children to gardening by encouraging them to plant a miniature garden of small, easy-to-care-for container-grown plants. Here are a few basic tips for successful container gardening. 1. Plants like living in a clean place. Before using a container, scrub it with warm soapy water and rinse it thoroughly. If you don't your plants may develop diseases. 2. Water and air need to pass through the soil to keep the plants healthy. Check to see whether the containers have drainage holes. If they don't drill some holes in the bottoms. Cover the openings with nylon-mesh screening (it cuts more easily than wire mesh) so the soil doesn't wash out when you add water. 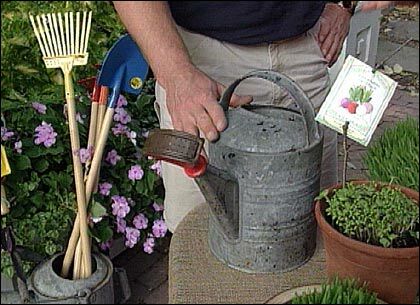 Fill the containers to 1 inch below the rim with bagged sterile potting soil. You can plant either seeds or seedling in pots. 3. 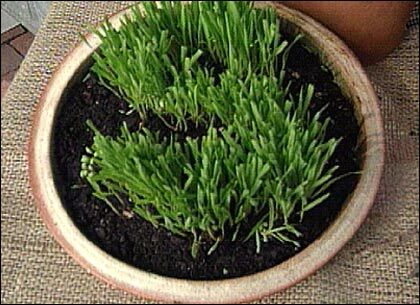 Treat container-grown plants to doses of organic fertilizer or compost. Water only when the top 2 inches of soil feel dry (check by poking with your finger). Overwatering a poor drainage are as damaging to plants as leaving them hungry and thirsty. Having a few child-size tools makes it much easier for kids to work alongside you in the garden. Hardware stores and nurseries both carry tools for kids: There are very small-scale sets for preschoolers and slightly larger, heavier ones for school-age children. If you can't afford tools, don't worry. For small projects and container gardening, a spoon and fork serve you well. Centuries ago, people tended large fields using only sticks, stones, bones, and shells. ROOTS, SHOOTS, BUCKETS & BOOTS: Gardening Together with Children.